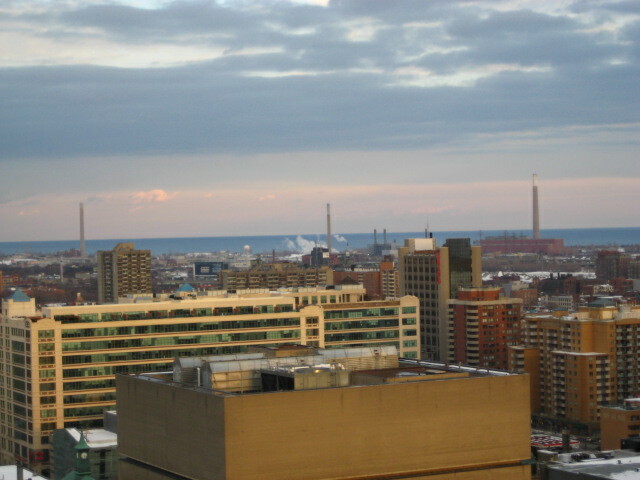 Im in my hotel room looking down yonge street at the lake.. what are the three big stacks i can see on the lakefront?? I may be wrong, but i'm guessing they are for the sugar plant.. Red Path or something?? If you're seeing three big "stacks"... you've been into it too soon TJ. Cripes boss... you in the penthouse? Can't be far from my wife... she's in the Bond Hotel. ....I only see one stack, how much you had? Is there a McDonalds on the opposite side of Yonge Street from you. When is the show TJ? I mean way to go Wayne. Based on the camera angle.. I'd say... I'll let someone else try a guess! 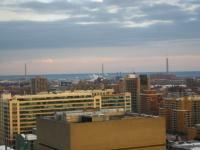 I think the stack on the right is the old Hearn generating station down at Cherry Beach TJ, and the one on the left looks like the sewage treatment plant over near Coxwell. Not sure about the one in the center but it's probably to do with the Hearn plant too. he is a small dude.... but a really nice guy! 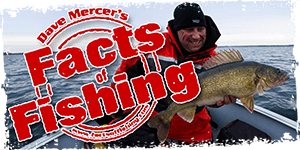 Rick Mercer is one funny guy. I'll bet he would be a hoot to spend a few hours with. ....Wow, Rick Mercer standing with a well known celebrity. Thanks Lew, I thought that was the generating station on the right, due to the building actually. Just couldn't remember the name. I'd say you're on the living room floor...about now. Lew got the two right. The one on the right is the ole Hearn power plant. Coal burner I believe. The one on the far left is from the poo-poo factory and the other one in the middle I think is from an old brick yard factory.